A lot of people have the wrong idea when they think of kidnapping. Kidnapping is a relatively specific crime in North Carolina. It involves more than just taking a person. 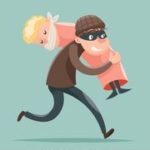 This blog focuses on kidnapping, but also discusses two crimes that are similar to (but less serious than) kidnapping in North Carolina – abduction of children and felonious restraint. Kidnapping in North Carolina is governed by North Carolina General Statute 14 – 39. Subjecting or maintaining such other person for sexual servitude in violation of G.S. 14-43.13. Kidnapping is broken down into two degrees, and is sentenced accordingly. Kidnapping in the first degree occurs if the person that was kidnapped either was not released in a safe place by the defendant OR the person was sexually assaulted or seriously injured. First Degree Kidnapping in North Carolina is punished as a Class C felony. Kidnapping in the second degree occurs if the defendant released the person kidnapped in a safe place and the person was not sexually assaulted or seriously injured. Second Degree Kidnapping in North Carolina punished as a Class E felony. In North Carolina, felonious restraint is punished as a Class F felony. It is less serious than kidnapping, and felonious restraint (and sometimes false imprisonment) are often times what people are actually referring to when they use the word “kidnapping”. Transports that person by motor vehicle or other conveyance from the place of the initial restraint. This is a separate offense from kidnapping in North Carolina. Abduction of children is punished as a Class F felony. It occurs when any person who, without legal justification or defense, abducts or induces a child who is at least four years younger than the defendant to leave any person, agency, or institution lawfully entitled to the child’s custody, placement, or care. To read about a similar topic, human trafficking, click here. If you have been charged with kidnapping in North Carolina, you should contact a criminal defense lawyer to discuss your options.